The litany of alarming observations about water use and misuse is now familiar—over a billion people without access to safe drinking water; almost every major river dammed and diverted; increasing conflicts over the delivery of water in urban areas; continuing threats to water quality from agricultural inputs and industrial wastes; and the increasing variability of climate, including threats of severe droughts and flooding across locales and regions. These issues present tremendous challenges for water governance. This book focuses on three major concepts and approaches that have gained currency in policy and governance circles, both globally and regionally—scarcity and crisis, marketization and privatization, and participation. It provides a historical and contextual overview of each of these ideas as they have emerged in global and regional policy and governance circles and pairs these with in-depth case studies that examine manifestations and contestations of water governance internationally. The book interrogates ideas of water crisis and scarcity in the context of bio-physical, political, social and environmental landscapes to better understand how ideas and practices linked to scarcity and crisis take hold, and become entrenched in policy and practice. 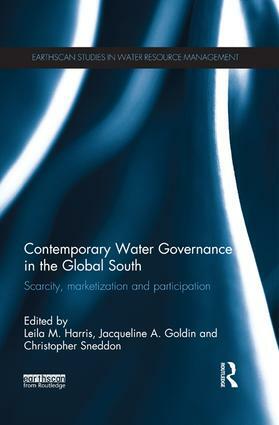 The book also investigates ideas of marketization and privatization, increasingly prominent features of water governance throughout the global South, with particular attention to the varied implementation and effects of these governance practices. The final section of the volume analyzes participatory water governance, querying the disconnects between global discourses and local realities, particularly as they intersect with the other themes of interest to the volume. Promoting a view of changing water governance that links across these themes and in relation to contemporary realities, the book is invaluable for students, researchers, advocates, and policy makers interested in water governance challenges facing the developing world. Leila M. Harris is an Assistant Professor in the Institute for Resources, Environment and Sustainability and in the Institute for Gender, Race and Sexuality and Social Justice at the University of British Columbia. She is also Co-Director of the Program on Water Governance (PoWG). Her work focuses on nature-society questions including inequality and environment and political ecology, particularly through investigation of water politics, access, and governance in the Global South. Jacqueline Goldin is the SADC WaterNet Chair for Water and Society and Associate Professor at the Institute for Water Studies, University of the Western Cape where she heads the Anthropology of Water (AoW) Research Group. The research group focuses on food and water security and the interface between human and ecosystem well-being, with attention to institutional settings as mediators between people and nature. Chris Sneddon is an Associate Professor in the Department of Geography and the Environmental Studies Program at Dartmouth College. His research and teaching focus on conflicts over water at multiple spatial scales, with a primary regional focus on the Mekong River basin of Southeast Asia.